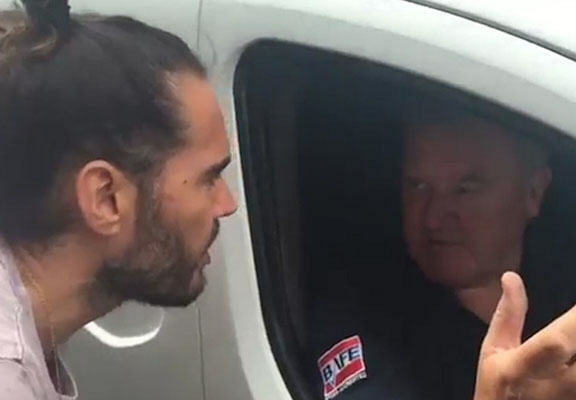 A new video shows the moment Russell Brand was forced to defend his position on the one minute’s silence for the victim’s of the Tunisia beach massacre to a man who lost two friends in the attack. Last week, comedian and actor Brand described the one minute’s silence to remember the victims on Friday as “complete bullsh*t”. In that original video, Brand claimed that the UK government is hypocritical to honour the Sousse victims at the same time as engaging in the arms trade and “carrying out foreign wars on behalf of corporations”, and the 40-year-old reiterated that stance here. I lost two people I know in the tragedy. I just wanted to ask you a question – what you meant behind your comments regarding the minute’s silence? Our government’s got loads of countries, it has a human rights abusers list, where it says these countries are dangerous countries, you shouldn’t go there, they’re dodgy, there’s dangerous terrorists there. And then our actual government helps arms companies to sell weaponry to those countries. If you really care about this and the situation, then don’t sell weapons to these countries – don’t arm them, or if you think business is more important that people’s lives, just sell the weapons and shut up. The comedian and activist’s divisive remarks in his original video sparked anger among many Britons, who felt they were disrespectful to victims of the shooting. I agree, with the government funding the terrorists with the arms and all that, but they sweep all that under the carpet don’t they?